Any dance festival is worth acknowledging, more so because of the platform it provides to the artists to showcase their talent and art. The initiative needs to be lauded if it is coming from the young breed of the dance fraternity. 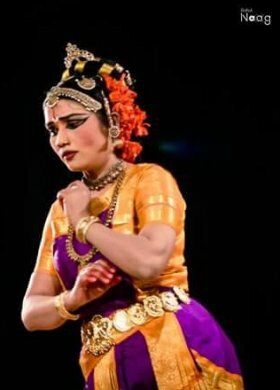 Young dancer Rashmi Aggarwal has been organizing Nritya Dhara - A Constant Flow of Dance, every year in New Delhi under the aegis of Sri Sudha Centre for Performing Arts with an aim to provide a stage to young and upcoming talents like her. This year, Nritya Dhara, in its seventh edition, was organized for two days. First day was classical dance competition for young children held at Lok Kala Manch, New Delhi on April 21. Second day at ICCR auditorium on April 22 featured Sarita Misra (Odissi), Sangeeta Chatterjee (Kathak), Meenu Thakur (Kuchipudi) and Rashmi Aggarwal (Bharatanatyam). The evening began with Rashmi Aggarwal's presentation 'Tana Varnam,' a rare composition of Lalgudi G. Jayaraman in talam adi and ragam Bahudari. Rashmi is a disciple of Guru Saroja Vaidyanathan. 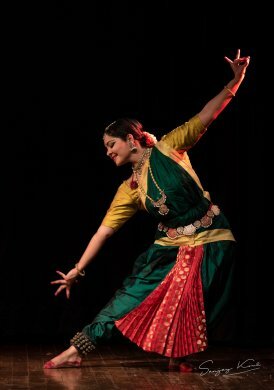 Her choice of Tana Varnam was a pleasant surprise because abhinaya has always been her strength as was visible in her past stage performances and here she chose a piece focused more on nritta than natya. 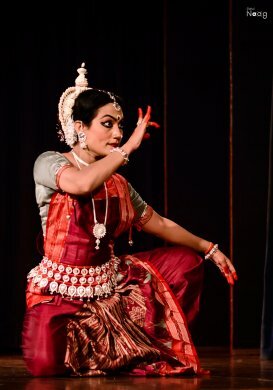 A piece choreographed by Guru Padmini Ravi was delightful and the dancer made extensive use of sancharis in her depiction of nayika where she attempts to find parallels to her love for Lord Karthikeya and emoted the love of stars and moon for each other and the togetherness of kajal and eyes and the way they beautify each other. Measured and neat hand and leg stretches were done with utmost vigour and vitality. Overall, it was an enjoyable performance. The next performer was seasoned Odissi artist from Bangalore, Sarita Misra. She was resplendent with grace and opalescence in her depiction of five elements in opening piece 'Panchabhuta'. The next piece was taken from Ramayana where she immaculately portrayed the episode of Surpanakha, her chance encounter with Rama and Lakshmana cutting off her nose. Blessed with a pair of arresting and eloquent eyes, she was picturesque and poetry in motion. She brought out innate grace and strong emotions of Surpanakha with ease, especially in the scenes when Surpanakha first saw Rama roaming in forest with Sita. Cupid struck Surpanakha, her heart brimming with longing for Rama and decorating herself for him was beautifully portrayed. The performance clearly placed her as a promising talent of Odissi dance. Sangeeta Chatterjee opened her performance with Shiva Parvati Stotra, set to ragam Bairagi and talam roopak. Sangeeta enchanted the audience with her graceful hand and footwork and apt abhinaya in her salutation to Lord Shiva as a personification of faith and Goddess Parvati personifying devotion. Sangeeta then went for a technical piece 'Teen taal' which was pure nritta that runs through footwork patterns padhant, amad, tukra and ladi. It was a complex footwork that she executed well. She ended with 'Varsha' by Surdas where she invoked the imageries of advent of monsoon with the malhar melody and perfectly enacted the scene of Lord Krishna's life where he lifted the Govardhan parvat. The evening ended with a performance of leading Kuchipudi dancer Meenu Thakur. 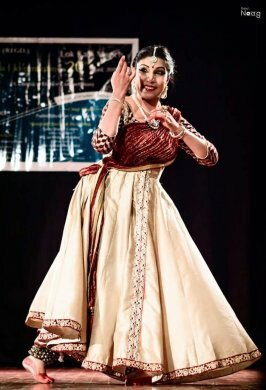 She presented the widely performed and traditional Kuchipudi dance drama Bhama Kalapam set in ragamalika and talamalika. Evoking various moods from the nayika, the artist was able to make smooth and effortless transition right from entry of Satyabhama in pravesha daru to kalahantarita, and finally to vasakasajjika nayika. The friendly banter of Lord Krishna's wife Satyabhama with her confidante Madhavi sprinkled with Hindi dialogues in Telugu song was amusing and certainly gave the performance a refreshing look. The concluding segment of the composition saw Meenu Thakur at her best while surrendering herself to the unconditional love for her lord. She ended her performance with Tarangam, inspired by the Krishna Leela Tarangini of Narayana Teertha where she danced on the rim of a brass plate. All the dancers performed to recorded music. Shilpi Aggarwal is an ardent admirer of Indian classical dance forms. She runs her own tabloid on art, culture and travel, Bleisure, in Delhi.